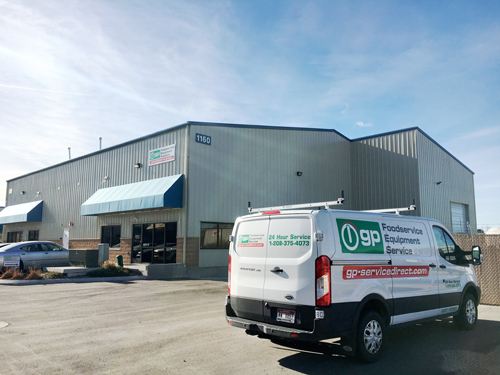 Our General Parts Group team of manufacturer-trained foodservice equipment repair technicians is available to service the Treasure Valley from our location at 1160 W. Taylor Avenue, Suite 110, Meridian. We are proud to be considered the experts in a variety of services including: commercial oven repair, food preparation equipment, ware-washing equipment, refrigeration units, ice machines, and HVACs. For further questions or information, you can contact our Boise office toll free at (208) 375-4073 or email us at BoiseDispatch@GP-ServiceDirect.com. The team is committed to ensuring your major foodservice equipment along with your HVAC, Refrigeration and ware-washing needs are taken care of. Custom maintenance & repair services – Our commercial appliance repair technicians are industry-certified, ensuring you receive the most efficient high quality service that takes the unique needs of your equipment and company into consideration. Whether it is a commercial oven or restaurant equipment repair, General Parts Group is the team to call. Small appliance repair – Our repair center located at our West Taylor Avenue office is equipped to repair those commercial appliances that are easy to move. You are welcome to bring them to us for our certified-technicians to work on. Warranty – We stand behind our food equipment service work so if the same issue reoccurs, you are covered by a 90-day labor warranty on all work performed. Keeping you informed – Our Automatic Status Update System provides you up to date information throughout your commercial kitchen service call. Should you have any questions or concerns during the process, our staff is more than happy to guide you through our procedures. O.E.M. Replacement Parts – Our certified technicians utilize O.E.M. replacement parts from our vast inventory for their work. If an O.E.M. part is all that you need, we can help. Our vast inventory can be found at our online store GP-PartsDirect.com. Pick the product up at this location, and ground shipping is free. Installations – Our certified technicians are able to install most brands. Contact us to schedule when is the most convenient for your operation. Need a factory authorized performance start-up? We can do those too! Click on our Authorized Manufacturer List to view brands that may qualify. Online information services – Would you like to be able to view your account information on-line? Click here to request access. Information available includes open orders, closed orders, account statement and lifecycle costs of your serviced equipment.